مرادزاده, علی, زارع, مهدی, دولتی ارده جانی, فرامرز. (1391). تشخیص منطقه آلودگی حاصل از زه‌آب اسیدی با استفاده از مدل‌سازی سه‌بُعدی داده‌‌های ژئوالکتریک در محدودة کارخانة زغال‌شویی البرز شرقی. 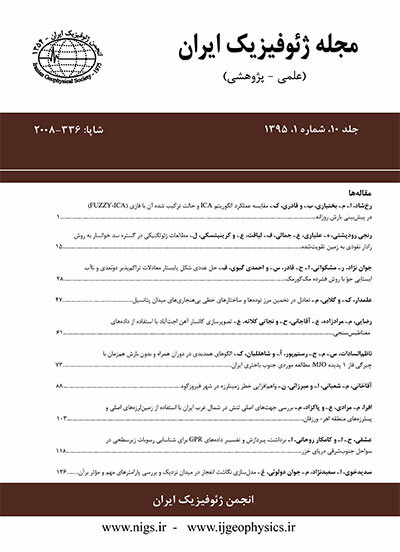 مجله ژئوفیزیک ایران, 6(2), 95-111. علی مرادزاده; مهدی زارع; فرامرز دولتی ارده جانی. "تشخیص منطقه آلودگی حاصل از زه‌آب اسیدی با استفاده از مدل‌سازی سه‌بُعدی داده‌‌های ژئوالکتریک در محدودة کارخانة زغال‌شویی البرز شرقی". مجله ژئوفیزیک ایران, 6, 2, 1391, 95-111. مرادزاده, علی, زارع, مهدی, دولتی ارده جانی, فرامرز. (1391). 'تشخیص منطقه آلودگی حاصل از زه‌آب اسیدی با استفاده از مدل‌سازی سه‌بُعدی داده‌‌های ژئوالکتریک در محدودة کارخانة زغال‌شویی البرز شرقی', مجله ژئوفیزیک ایران, 6(2), pp. 95-111. مرادزاده, علی, زارع, مهدی, دولتی ارده جانی, فرامرز. تشخیص منطقه آلودگی حاصل از زه‌آب اسیدی با استفاده از مدل‌سازی سه‌بُعدی داده‌‌های ژئوالکتریک در محدودة کارخانة زغال‌شویی البرز شرقی. مجله ژئوفیزیک ایران, 1391; 6(2): 95-111. در سال‌‌های اخیر، روش‌‌های ژئوفیزیکی الکتریکی خصوصاً روش‌‌های سه‌بُعدی ژئوالکتریک، به‌‌طور موفقیت‌‌آمیزی در بررسی‌های زیست‌محیطی مورد استفاده قرار گرفته‌‌اند. باطله‌های تولید شده از کارخانجات زغال‌شویی، اغلب حاوی مواد سولفیدی هستند. حضور این مواد در مجاورت آب و اکسیژن هوا، باعث تولید زهاب اسیدی می‌‌شود. زهاب تولیدی به دلیل داشتن pH کم و غلظت‌‌های زیاد SO4-2 و Fe2+ سبب بروز مشکلات زیست‌محیطی در دراز‌‌مدت می‌شود. در این مقاله، هدف این است تا آلودگی‌‌های تولیدی حاصل از انباشت باطله کارخانه زغال‌شویی البرز شرقی شاهرود با استفاده از روش‌‌های ژئوفیزیکی الکترومغناطیس با بسامد بسیار کم (VLF-EM) و همچنین روش مقاومت ویژه (DC) با استفاده از روش برداشت و مدل‌سازی سه‌بُعدی مورد بررسی قرار بگیرد. نتایج حاصل از تحقیق نشان می‌دهد که روش VLF در آشکار کردن مسیرهای حرکت آلودگی در پایین‌دست محل دپوی باطله‌ها، خوب عمل کرده است ولی دقیقاً نتوانسته گسترش عمقی مناطق آلوده را مشخص کند. این در حالی است که مدل‌سازی سه‌بُعدی داده‌‌های ژئوالکتریک، زون آلوده‌‌ای به ضخامت حدود 30 متر را در اعماق بین30 تا 60 متری در بخشی از پایین‌دست منبع آلودگی مشخص کرده است. Nowadays, geophysics, and three-dimensional (3D) ground geoelectrical methods in particular are successfully associated with environmental investigations. The waste produced by coal washing operations often contains sulfide materials specifically pyrite. The appropriate atmospheric conditions and moisture favor rapid pyrite oxidation and subsequent acid mine drainage (AMD) formation. This AMD that contains high concentrations of iron, sulfate, low pH and variable concentrations of toxic metals is a major cause of long-term environmental problems. Since, the pollutants produced by pyrite oxidation processes in the groundwater flow system may change considerably the conductivity of the polluted zone, the electric and electromagnetic (EM) geophysical methods could effectively be used to map these zones. Resistivity and very low frequency electromagnetic (VLF-EM) are commonly used for this purpose. This paper discusses the results of a geophysical survey incorporating two different methods comprising VLF-EM and 3D electrical resistivity and attempts to detect the pollution emanated from the wastes produced by Alborz Sharghi Coal Washing Plant. This plant, which is located at 380 km northeast of Tehran and 57 km northwest of Shahrood City in Semnan Province, has being working for 30 years. The input feed of the processing plant is 500,000 ton per year. The coal recovery in the plant is 50%. The rest of the input feed is dumped as wastes around the plant. Depending on the method used for coal processing, two kinds of the waste are produced and dumped in the distinct places. The first kind is produced by a jig machine while the second is produced by a flotation process. It is expected that the amount of the coal waste to be about 3 million tons in the study area. A geophysical survey using the VLF-EM method was first performed with a measuring spacing of 5 meters on 4 parallel profiles of 30-m distance in the downstream of the waste dump in order to investigate the likely polluted zones. The VLF measurements were carried out using a portable WADI-VLF digital instrument of ABEM Co. The measured data was then processed using RAMAG computer software. To simplify the data interpretation, the VLF raw data were filtered using the Karous-Hjelt technique and a set of vertical current density pseudo-sections were provided. The results of interpretation detected two polluted zones in the downstream of the waste dump. These polluted zones can be easily recognized between profiles 1 and 3 with high values of current density. The VLF survey was found to be good in identifying the path ways for pollution movement downstream the coal washing dump, but limited in its ability to exactly distinguish the depth of polluted zones. Due to this problem, the area located between profiles 1 and 3 was then selected for a 3D geoelectrical survey to better investigate the pollutant leaching process. The electrical resistivity method produces an image and/or an approximate model of the subsurface resistivity. Various arrays including pole-pole, pole-dipole, and dipole-dipole arrays are normally used for 3D resistivity surveys. In the present research, a 3D geoelectrical survey using a pole-dipole array was carried out on a 6 6 rectangular grid with different electrode spacing of 15 m and 30 m in x- and y directions, respectively by a portable SAS 1000 instrument from ABEM Co. As the pole-dipole array is an asymmetrical array, measurements were made with the forward and reverse arrangements of the electrodes on each profile in x- and y directions. Two more profiles were also considered in the direction of diameters of the rectangular grid. A computer software called RES3DINV which incorporates a smoothness-constrained least-squares approach was then used to perform an inverse modeling on the measured apparent resistivity data. To perform a 3D inverse modeling, the subsurface of the survey area was divided into several layers and each layer was further subdivided into a number of rectangular blocks with unknown resistivities. The interior blocks within each layer had the same size. The main objective of the inversion process was to determine the resistivity of each block in a manner that the model response fitted well the measured apparent resistivity data. The RES3DINV program utilizes least squares Gauss–Newton and quasi-Newton optimization methods for modeling process. This model can apply both numerical finite difference (FD) and finite element (FE) methods for calculation purposes. The results of inversion have been provided as sets of horizontal and vertical resistivity sections and also a 3D resistivity model was finally presented using SlicerDicer software. This 3D geoelectrical model illustrated a polluted zone with a thickness of about 30 meters at the depths between 30 and 60 meters. A geophysical survey using the VLF-EM method was first performed with a measuring spacing of 5 meters on 4 parallel profiles of 30-m distance in the downstream of the waste dump in order to investigate the likely polluted zones. The VLF measurements were carried out using a portable WADI-VLF digital instrument of ABEM Co. The measured data was then processed using RAMAG computer software. To simplify the data interpretation, the VLF raw data were filtered using the Karous-Hjelt technique and a set of vertical current density pseudo-sections were provided. The results of interpretation detected two polluted zones in the downstream of the waste dump. These polluted zones can be easily recognized between profiles 1 and 3 with high values of current density. The VLF survey was found to be good in identifying the path ways for pollution movement downstream the coal washing dump, but limited in its ability to exactly distinguish the depth of polluted zones. Due to this problem, the area located between profiles 1 and 3 was then selected for a 3D geoelectrical survey to better investigate the pollutant leaching process. The electrical resistivity method produces an image and/or an approximate model of the subsurface resistivity. Various arrays including pole-pole, pole-dipole, and dipole-dipole arrays are normally used for 3D resistivity surveys. In the present research, a 3D geoelectrical survey using a pole-dipole array was carried out on a 66rectangular grid with different electrode spacing of 15 m and 30 m in x- and y directions, respectively by a portable SAS 1000 instrument from ABEM Co. As the pole-dipole array is an asymmetrical array, measurements were made with the forward and reverse arrangements of the electrodes on each profile in x- and y directions. Two more profiles were also considered in the direction of diameters of the rectangular grid. شرکت زغال‌سنگ البرز شرقی، 1357، اکتشافات تفصیلی منطقه زغالی پشکلات: گروه تهیه گزارش‌های دفتر فنی اکتشافات شرکت زغال‌سنگ البرز شرقی، 183. شرکت زغال‌سنگ البرز شرقی، 1360، اکتشافات تفضیلی منطقه زغالی رزمجا: گروه تهیه گزارش‌های دفتر فنی اکتشافات شرکت زغال‌سنگ البرز شرقی، 241. شرکت زغال‌سنگ البرز شرقی، 1386، گزارش اطلاعات مربوط به زغال‌شویی و آزمایشگاه کیفیت زغال: آرشیو شرکت زغال‌سنگ البرز شرقی، 85. جدیری شکری، ب، مراد زاده، ع.، دولتی ارده جانی، ف. و انصاری جعفری، م.، 1388، شناسایی آلودگی‌‌های زیست‌محیطی ناشی از محل انباشت باطله‌‌های کارخانه زغال‌شویی با استفاده از مطالعات ژئوفیزیکی: فصلنامه علمی-پژوهشی علوم و تکنولوژی محیط زیست (در نوبت چاپ). مرادزاده، ع.، دولتی ارده جانی، ف. و فلاح پیشه، س.، 1387، مطالعه محدوده آلودگی ناشی از معدن‌کاری سرب و روی تاش با روش­های ژئوفیزیکی VLF، IP و مقاومت ویژه: سیزدهمین کنفرانس ژئوفیزیک ایران، تهران، 288-283. ABEM, 1999, Instruction manual for Terameter SAS 1000. ABEM, 2000, ABEM instruction manual, WADI- VLF instrument. ABEM, 2002, RAMAG instruction manual, VLF survey planning and interpretation software. Al-Tarazi, E., Abu Rajab, J., Al-Naqa, A., and El-Waheidi, M., 2008, Detecting leachate plumes and groundwater pollution at Ruseifa municipal landfill utilizing VLF-EM method: J. Appl. Geophys., 65, 121–131. Benson, A. K., Payne, K. L., and Stubben, M. A., 1997, Mapping groundwater contamination using DC resistivity and VLF geophysical methods: Geophysics, 62, 80-86. Bentley, L. R., and Gharibi, M., 2004, Two- and three-dimensional electrical resistivity imaging at a heterogeneous remediation site: Geophysics, 69, 674–680. Brunner, I., Friedel, S., Jacobs, F., and Danckwardt, E., 1999, Investigation of a tertiary Maar structure using three-dimensional resistivity imaging: Geophys. J. Int., 136, 771–780. Casas, A., Himi, M., Diaz, Y., Pinto, V., Font, X., and Tapias, J., 2008, Assessing aquifer vulnerability to pollutants by electrical resistivity tomography (ERT) at a nitrate vulnerable zone in NE Spain: Environ. Geology, 54, 515-520. Dahlin, T., and Bernstone, C., 1997, A roll-along technique for 3D resistivity data acquisition with multi-electrode arrays: SAGEEP'97, Reno, Nevada, Extended Abstracts, 927-935. Doulati Ardejani, F., Jodieri Shokri, B., Moradzadeh, A., Soleimani, E., and Ansari Jafari, M., 2008, A combined mathematical-geophysical model for prediction of pyrite oxidation and pollutant leaching associated with a coal washing waste dump: International Journal of Environmental Science and Technology (IJEST), 5, 517-526. Fahringer, P., 2002, Shallow EM investigations of AMD at an abandoned coal mine in northern West Virginia: The Leading Edge, 478- 481. Frid, V., Liskevich, G., Doudkinski, D., and Korostishevsky, N., 2007, Evaluation of landfill disposal boundary by means of electrical resistivity imaging: Environ. Geology, 49, 839-853. Gharibi, M., and Bentley, L. R., 2005, Resolution of 3-D electrical resistivity images from inversions of 2-D orthogonal lines: Journal of Environmental and Engineering Geophysics, 10, 339–349. Hammack, R. W., Sams, J. I., Veloski, G. A., and Mabie, J. S., 2003, Geophysical investigation of the Sulphur Bank Mercury Mine Superfund Site, Lake County, California: Mine Water and the Environment, 22, 69-79. Kamkar Rouhani, A., 2001, Developments in resistivity methods for detection of subsurface pollution: 31st Congress of International Association of Hydro-geologists (IAH), Extended Abstracts, 734-738. Karous, M., and Hjelt, S. E., 1989, Linear filtering of VLF dip angle measurements: Geophysical Prospecting, 31, 782-794. King, A., 1994, Application of geophysical methods for monitoring acid mine drainage: CANMET Library. Li, Y., and Oldenburg, D. W., 1992, Approximate inverse mappings in DC resistivity problems: Geophys. J. Int., 109, 343-362. Loke, M. H., and Barker, R. D., 1996, Practical techniques for 3D resistivity surveys and data inversion: Geophysical Prospecting, 44, 499-523. Loke, M. H., 1999, Electrical imaging surveys for environmental and engineering studies, a practical guide to 2-D and 3-D surveys: Geotomo Software Co.
Loke, M. H., 2002, RES3DINV, Rapid 3D resistivity & IP inversion using the least squares method: Geotomo Software Co.
Mansoor, M., and Slater, L., 2007, Aquatic electrical resistivity imaging of shallow-water wetlands: Geophysics, 75, 211-221. Milson, J., 2002, Field geophysics: Cambridge University Press. Nyquist, J. E., and Roth, M. J. S., 2005, Improved 3D pole–dipole resistivity surveys using radial measurement pairs: Geophysical Research Letters, 32, L21416. Ogilvy, R. D., and Lee, A. C., 1991, Interpretation of VLF-EM in-phase data using current density pseudo- section: Geophysical Prospecting, 39, 567–580. Ogilvy, R., Meldrum, P., Chambers, J., and Williams, G., 2002, The use of 3D electrical resistivity tomography to characterize waste and leachate distributions within a closed landfill, Thriplow, UK: Journal of Environmental and Engineering Geophysics, 7, 11-18. Ogilvy, R. D., Kuras, O., Palumbo-Roe, B., Meldrum, P. I., Wilkinson, P. B., Chambers, J. E., and Klinck, B. A., 2009, The detection and tracking of mine–water pollution from abandoned mines using electrical tomography: International Mine Water Conference. Pretoria, South Africa. Oldenburg, D. W., 1996, DC resistivity and IP methods in acid mine drainage problems, results from the Copper Cliff mine tailings impoundments: J. Appl. Geophys., 34, 187-198. Paterson, N., 1997, Remote Mapping of Mine Wastes: 4th decennial international conference on mineral exploration, Canada, 905–916. Perozzi, L., and Holliger, K., 2008, Detection and characterization of preferential flow paths in the downstream area of a hazardous landfill: Journal of Environmental and Engineering Geophysics, 13, 343-350. Radulescu, M., Valerian, C., and Yang, J., 2007, Time-lapse electrical resistivity anomalies due to contaminant transport around landfills: Annals of Geophysics, 50, 453-468. Reynolds, J.M., 1997, An introduction to applied and environmental geophysics: John Wiley & Sons Ltd., Chapter 7, 422-423. Rucker, D., and Fink, J., 2007, Inorganic plume delineation using surface high resolution electrical resistivity at the BC Gribs and Trenches Site, Hanford: Vadose Zone J., 6, 946-958. Rucker, D.F., Levitt, M.T., and Greenwood, W.J., 2009a, Three-dimensional electrical resistivity model of a nuclear waste disposal site: J. Appl. Geophys., 69, 150–164. Rucker, D. F., Glaser, D. R., Osborne, T., and Maehl, W. C., 2009b, Electrical resistivity characterization of a reclaimed gold mine to delineate acid rock drainage pathways: Mine Water and the Environment, 28, 146-157. Saharan, M. R., Gupta, K. K., Jamal, A., and Sheoran, A. S., 1995, Management of acidic effluents from tailing dams in metalliferous mines: Mine Water and the Environment, 14, 85-94. Samsudin, A. R., Yaacob, W. Z., and Hamzah, U., 2006, Mapping of contamination plumes at municipal solid waste disposal sites using geoelectric imaging technique, Case studies in Malaysia: Journal of Spatial Hydrology, 6, 13-22. Santos, F. A. M., Mateus, A., Jorge Figueiras, J., and Gonçalves, M. A., 2006, Mapping groundwater contamination around a landfill facility using the VLF-EM method, a case study: J. Appl. Geophys., 60, 115-125. Santos, F. A. M., and Sultan, S. A., 2008, On the 3-D inversion of vertical electrical soundings; Application to the South Ismailia area-Cairo desert road, Cairo, Egypt: J. Appl. Geophys., 65, 97–110. Sasaki, Y., 1994, 3-D resistivity inversion using the finite-element method: Geophysics, 59, 1839-1848. Singer, P. C. and Stumm, W., 1970, Acidic mine drainage, The rate determining step: Science, 167, 1121-1123. Soupios, P., Papadopoulos, I., Kouli, M., Georgaki, I., Vallianatos, F., and Kokkinou, E., 2006, Investigation of waste disposal areas using electrical methods, a case study from Chania, Crete, Greece: Environ. Geology, 51, 1249-1261. Spindler, K., and Olyphant, G., 2004, Geophysical investigations at an abandoned mine site subjected to reclamation using a fixated scrubber sludge cap: Environmental Eng. Geosciences, 10, 243-251. Tiwary, R. K., 2001, Environmental impact of coal mining on water regime and its management: Water, Air, and Soil Pollution, 132, 185-199. Vega, M., Osella, A., and Lascano, E., 2003, Joint inversion of Wenner and dipole–dipole data to study a gasoline-contaminated soil: J. Appl. Geophys., 54, 97– 109. Yuval, D., and Oldenburg, W., 1996, DC resistivity and IP methods in acid mine drainage problems; results from the Copper Cliff mine tailings impoundments: J. Appl. Geophys., 34, 187-198.